Sometimes, as parents, we go to great lengths to provide comfort and soothe our babies. This is especially true when it comes time for sleeping. I am a mother of 4 children. Each one of them have needed some level of comfort and soothing to get to sleep. From pacing around the house with a swaddled infant to creating white noise close to where they sleep, I have done it all. Sometimes things worked great, other times failed miserably. One of the most consistent ways my children felt comforted and soothed was through soft music and vibrations. Typically this occurred in a baby swing or baby bouncer, however, it is not recommended as a place to leave your children long periods of time for sleeping. Once my babies were in a deep sleep, I would always have to move them to their bed, risking waking them and starting the whole comfort and soothing routine over. Graco has a new pack n’ play with soothe technology that is designed to provide comfort and soothe your baby, from newborn to toddler. The soothe technology is easily attached to the newborn napper and the bassinet. It has 10 different sound settings, with soothing vibrations that are synchronized to the music. The newborn napper allows your baby to be comfortably supported. It safety attaches to the sides of the pack n’ play, sitting high enough for easy access from the bedside. If you had a C-section you do not have to bend over to lay your baby down. That is a huge plus in my eyes! One thing I would have liked to see on the napper is a safety belt. The napper is meant for newborn babies up to 3 months. The safety guide specifically states it is for “infants up to 3 months, unable to roll over.” Although babies may not be able to roll over before 3 months of age, having a safety belt would bring me more piece of mind. The changing table is a nice to have pair with the napper. It is very sturdy and holds an infant up to 30lbs. I put my 15month old in it to see if it really would work for a baby that weighted up to 30lbs, and it did indeed past the test. Not only did it work for her, but she actually liked it. I haven’t used a changing table in a few months, but now I may just start using one again. 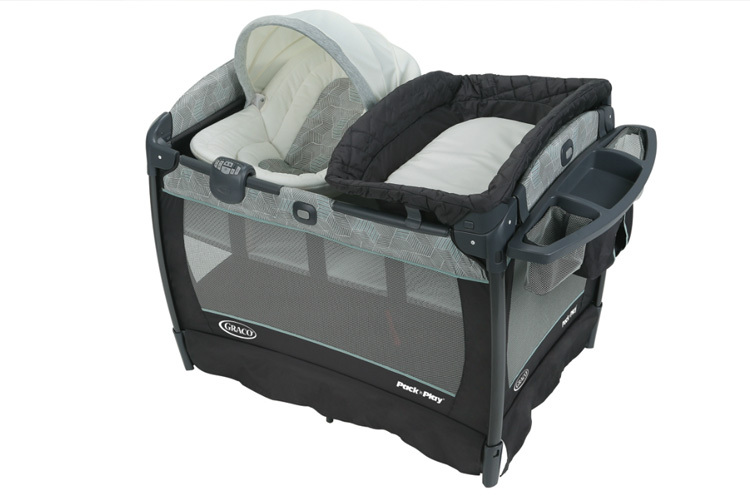 By taking off the infant napper and changing table the pack n’ play converts into bassinet. 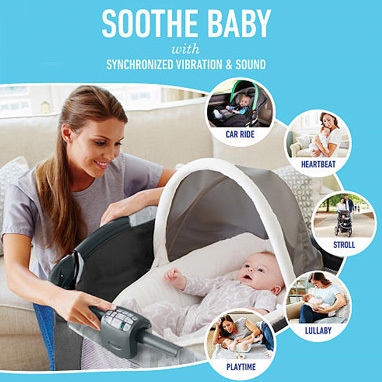 The cool thing about this is that the soothe technology also works with the bassinet. If you have been using this pack n’ play from the time your child was a newborn, the transition from the napper to the bassinet will be a breeze. The soothing technology that hooks into the napper, also hooks into the bassinet feature. This makes the entire bassinet vibrate in-sync to the music, exactly as it does with the napper. The bassinet is good for children under 15lbs. 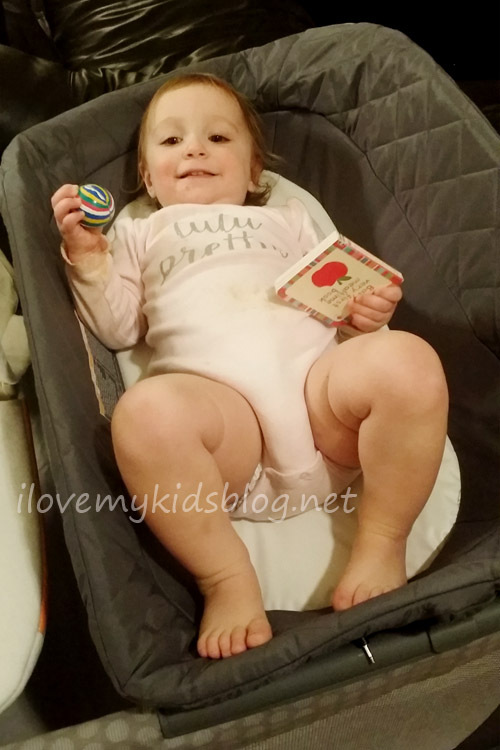 It is not very low in the pack n’ play, so once your baby can sit up on their own, I would recommend not using it any longer and transitioning to the placard as the crib. The final transition this pack n’ play offers is the playard. Ideal for infants 5 months and up, this feature gives great versatility for play and sleep time. It stores easily and can be packed with you anywhere you go. I have taken playards with me to the swimming pool, soccer fields, and on vacations. If you are looking for a great item for a new baby, this one would be perfect. It has everything needed to provide comfort, safety, and soothing for years to come. What items do you typically buy for your babies to help provide comfort and soothe them? This item is perfect to add to that list and can be purchased at Babies R’ Us, Target, Walmart, and online.